It's here! My crazy weekend of art shows! The weekend which has made me wonder how insane I am to sign up for basically two shows in three days. I guess we'll find out next week if insane or genius is the right word. Tonight at Junction City in Peoria IL I will be participating in the second day of Artists on the Boardwalk. It is the 4th Friday during the summer months. Stop by the boardwalk to see a bunch of artists, eat some surprisingly good grilled food, see all the boutiques, and have a beer at the pub. Junction City was throwing a Summer Solstice event last Friday with a petting zoo, circus performers, and other family friendly attractions. Summer Solstice was postponed due to crazy storms, and will be going on today in conjunction with Artists on the Boardwalk. It will be quite the evening so don't miss it. Saturday and Sunday is the Rhapsody in Bloom art show at the Luthy Botanical Garden in Peoria IL. This is a big show for me...lots of firsts. First show that I need to set up and fill a 10x10 canopy space. First show that is two consecutive days. First show that is more than 6 hours long. I am a combination of nervous and excited. Right now mostly excited. This should be a good show. It's a set in a beautiful setting. It's not a huge show, about 50 artists. Live music, food, and a silent auction. It runs Saturday from 10-5 and Sunday from 12-5. Stop by and check it out. 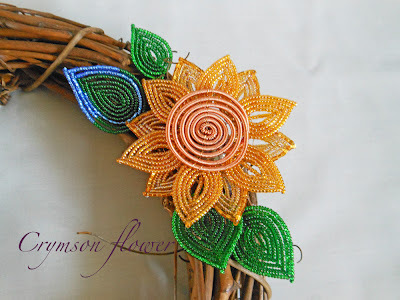 Night Sky wreath is sort of the complete color spectrum opposite of my recent SunFlower wreath. I made these lilies a while back and fell in love with how rich they are. The combination of blues and purples reminded me of the night sky, after the sun goes down but before the lightening bugs stop glowing and go to bed. 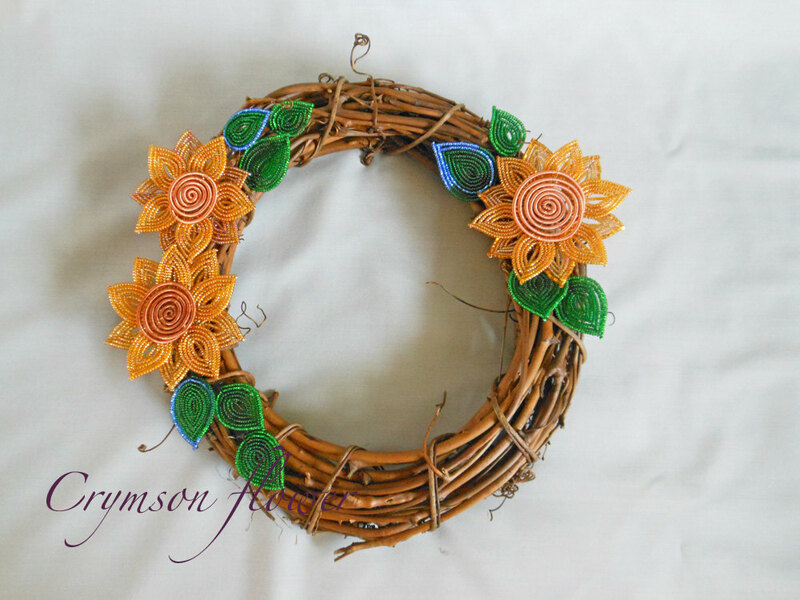 I added some small silver flowers to lighten up the wreath a bit and gave them orange centers for an interesting and unexpected pop of color. 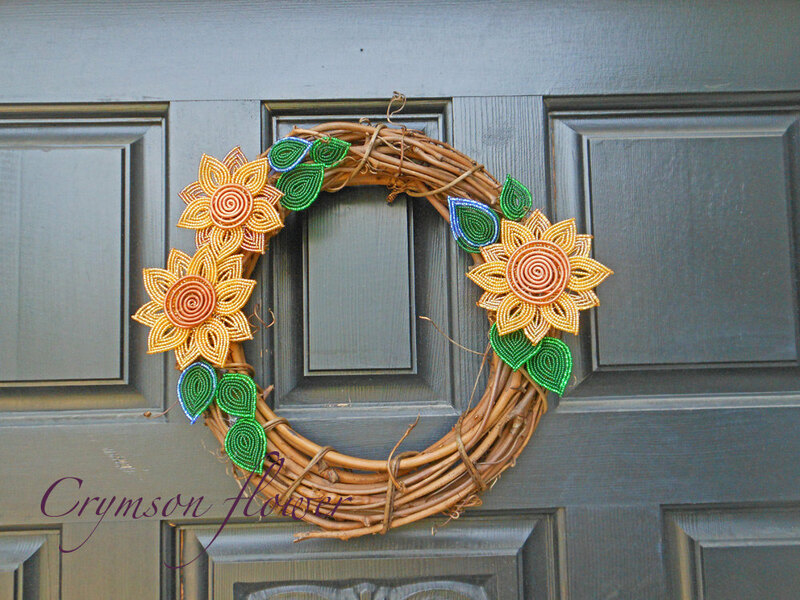 There are two kinds of leaves on the wreath. One with lime green and the other is all grass green but with some silverlined cut green beads to give a little sparkle. I was a little worried about the dark richness of lilies not working on a dark door. But there doesn't seem to be any problem in the picture below. In fact I think the wreath does a good job of standing on it's own. Move over strawberry wreath I have a new favorite! Sunflowers are classic. They bloom in the late summer, autumn and yet can be on display year round. They are warm and happy and welcoming. It was a lot of fun coming up with these flowers for this wreath. 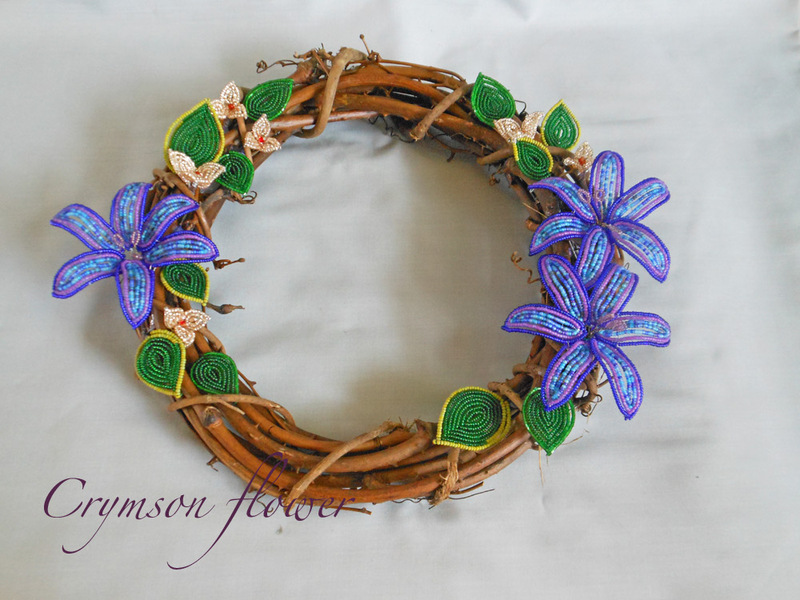 There are three flowers on this wreath. Each one is slightly different from the others, both in size and beads used. They all have a wire wrapped center that will tarnish into a rich copper brown. Or if you'd rather you can keep it polished copper pink. I used a little blue in some of the leaves to give a little pop. Thank you to everyone who sent me emails with suggestions for my booth. I got some amazing advice. Biggest being I need more color! Agreed. I've made some lists and am spending the next few evenings working on these changes. I'm going to try and get as many as I can done by Friday. First up is tonight and attempting to put some fabric on the folding screen wall. I'm hesitant to paint so lets see what fabric can accomplish! The power of hind site is 20/20 for sure. Had I known it wasn't really going to rain I wouldn't have rushed through pictures and tear down of the display. Had I known it was going to cool down I would have waited until mid afternoon to set up the booth. And so I set out in mid morning while the sun was shining and the humidity was so thick you could drown in it and set up, snapped pics, and tore down in 3 hours. Phew...5 and a half hours later and I'm still exhausted from it. OK...here's where I stop whining and start asking ever so nicely for your help. Here are the pictures I took of my booth. Imagine you are walking through a lovely botanic gardens, plants and trees oh so pretty, and interspersed in the gardens is an art show. 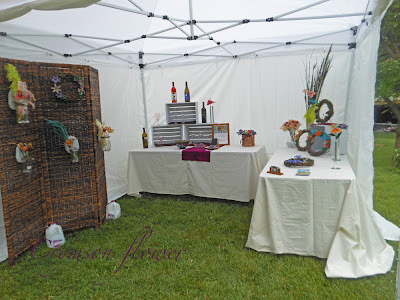 10x10 foot booths filled with handmade goodies. Would you stop and come into my booth? Be honest? What catches your eye? Is it a display? is it the sparkle of one of the flowers? Is it my welcoming smile? Any feedback any thoughts would be greatly appreciated. 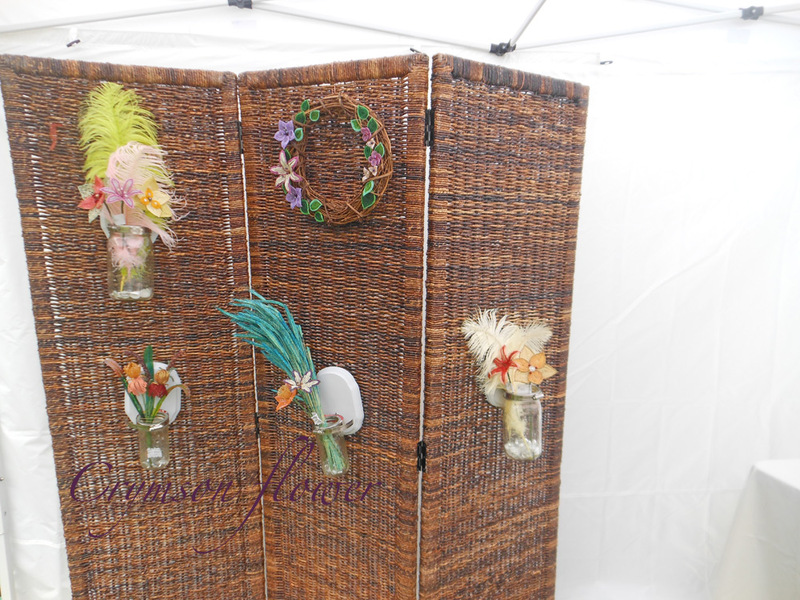 Booth displays are always a work in progress and I'm still at the beginning of my work. Would you walk in or pass by? Even if you'd pass by I'd like to know. So all thoughts are helpful. I was pretty happy that I didn't have to add a third table into the booth to fill it. The side table is a little bare, I'm hoping to get one more wreath done in time for the show. That a couple more calla lilies that I have waiting to be laced. Side table also has some new bud vases that are very modern looking. Another example of how to display a flower as every day home decor. Thank you so much for looking and any comments, emails, or opinions I can get. Today is technically three sneak peaks. All of what I have to show are new, and I'm equally excited about each one. I have a solo weekend starting today. I plan to spend most of the time prepping for next weeks shows. That means a mock booth set up tomorrow and lots of new flowers. On FaceBook a few days ago I had someone ask if I made Calla Lilies and Gerber Daisies. I'd attempted both in the past but haven't tried either one since I picked up the beads again. Gerber Daisies are complicated with lots of petals and lacing. Calla Lilies are slightly easier in that it is one large petal but getting it to lay properly was always my problem. That night I stayed up late goofing around and this is what I came up with. I'm over the moon excited about this Calla Lilly. I have an album on FB with more images that show the curl in the petal. 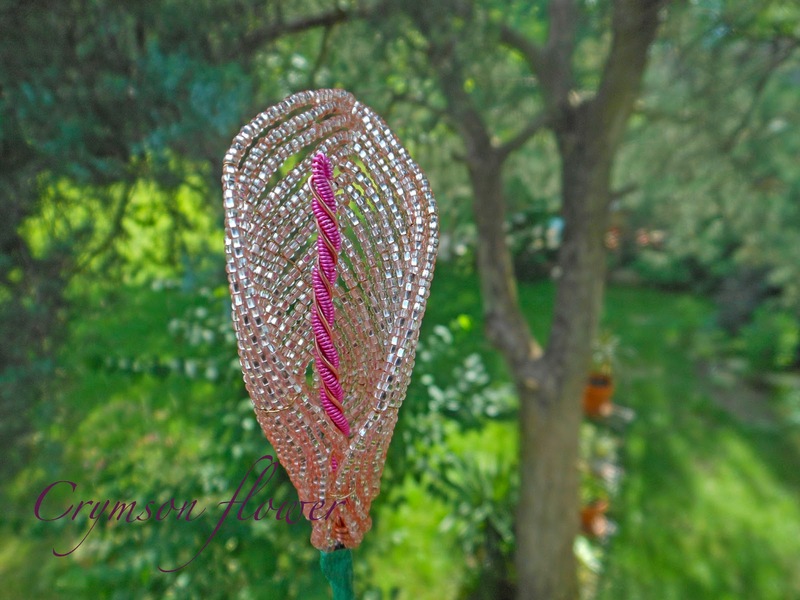 The center is bright pink and copper wire. I hope to get three more made for next week. 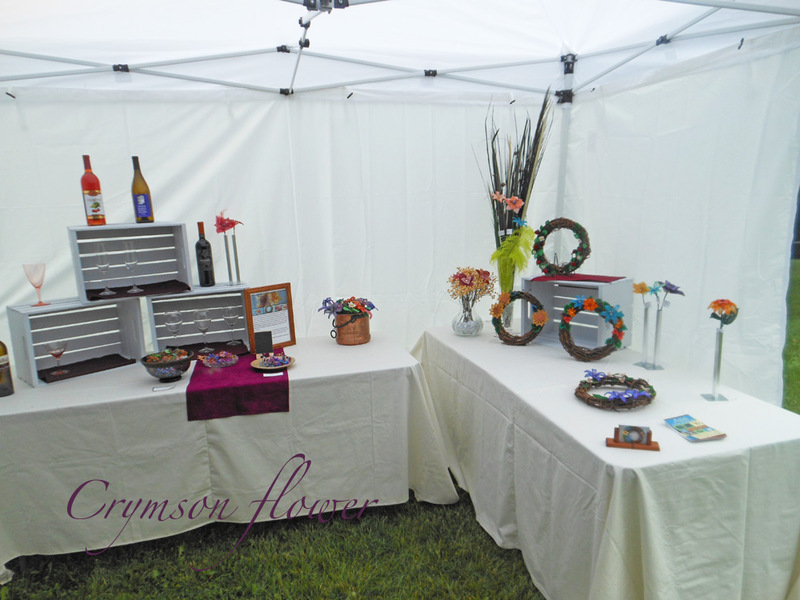 The Rhapsody in Bloom art show means I need to fill a 10x10 booth. Which means I need to fill up another tables worth of inventory. I'm making more wreaths. Actually, I'm loving making wreaths. And this one is pretty much already finished. It is my new favorite wreath. 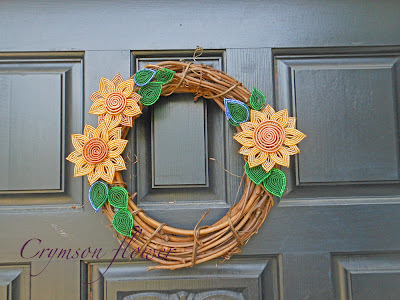 Sorry Strawberry wreath, I love berries but it is Sunflower season! This pile is much more organized now that I've spent a couple hours working on it. 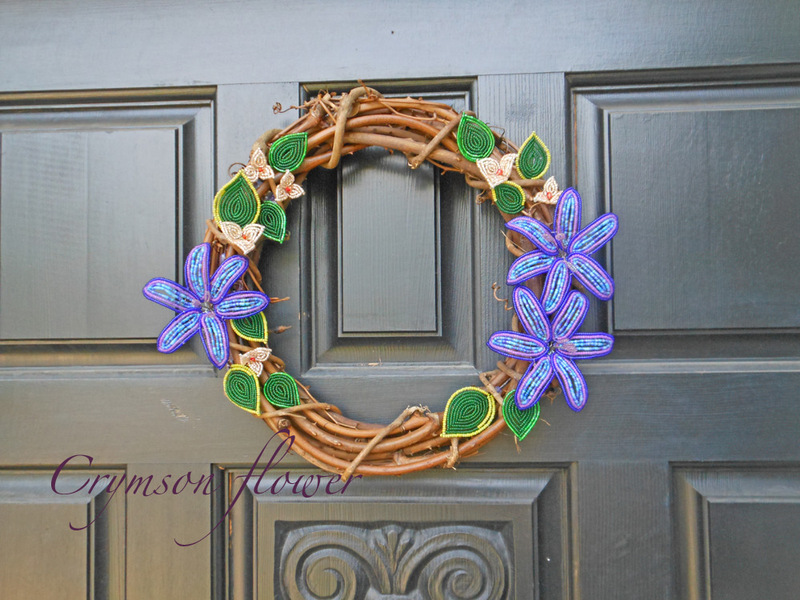 The dark blue lilies will combine with those little silver petals to make one amazing wreath. This will be done by the end of the weekend. Underneath this pile are some turquoise petals, these will become my third new wreath. I'm having some exciting design ideas with these and I'm hoping they pan out. I've typed "actually" about 5 extra times in this post and deleted it. I've been watching Sherlock, the BBC version and in love. But apparently I think I'm British now. I really just can't get how they say "actually" out of my head! What are you watching right now? Is it a good show/movie to work to? 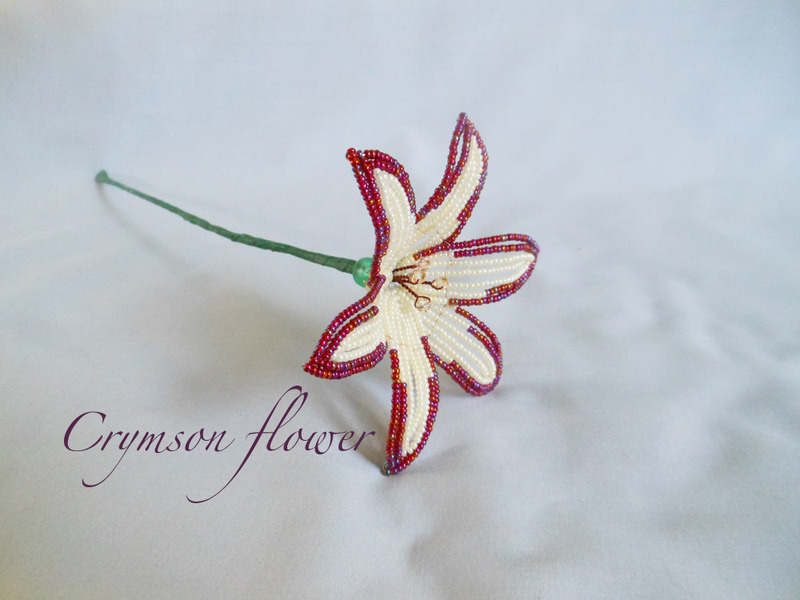 This garnet tipped lily will be available for silent auction at the Rhapsody in Bloom art festival at the Luthy Botanic Gardens here in Peoria IL. As an artist participating in the art show I was asked to donate to the auction. I made this simple yet classic lily just for the cause. Peoria is a small town with big city stuff. We have a pretty decent zoo, plus another wildlife refuge not far away. We have a museum w/ a planetarium. And we have a botanic gardens. I try and support our local facilities as much as possible. It just seems pretty cool that we have access to this stuff. Down to a week and a few days before this big show. The Friday before Rhapsody is the second installation of Artists on the Boardwalk at Junction City. Next weekend will be crazy! This weekend and next week will be all about the prep. Which means new flowers and wreaths!!! Did you know we are in the middle of wedding season? June is a big months for weddings. And while if you are getting married this June you will already have your flowers in order...but if you are looking for some ideas for your own upcoming wedding take a peak at this bouquet. A very good friend of mine got married last December. 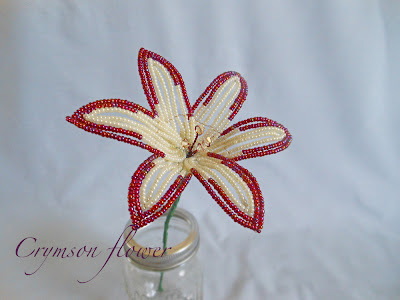 Way back years and years ago she had said that when she got married she wanted beaded flowers in her bouquet. So when she got engaged early last year, she held me up to my promise. I wasn't beading at the time so I dug through my treasures and found this beauty of a wedding bouquet. Remember my project "A Gift for the Gods?" 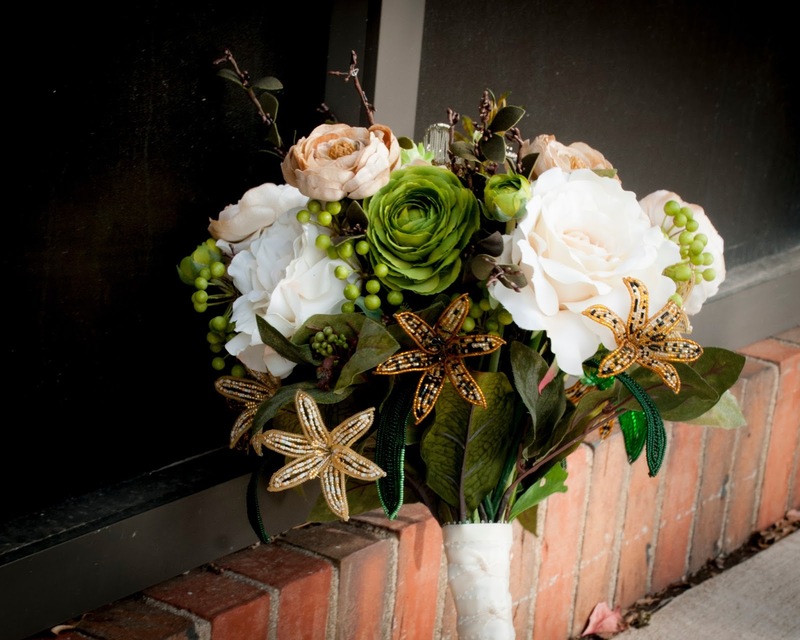 It's a wedding bouquet and it was the perfect color pallet to match her very natural color theme. She wanted a larger bouquet so she took the beaded flowers to a local florist and took apart the ribbon holding it all together. They then designed the a larger bouquet using silk flowers (although fresh works too). They used the whole thing, leaves and all the lilies in many different sizes. 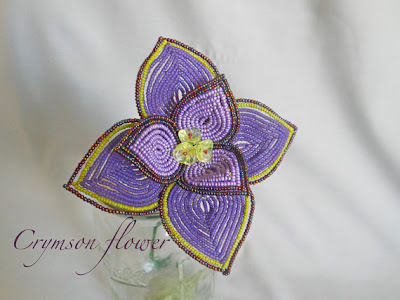 There are many different ways beaded flowers can work in a bridal bouquet. They can accent the bouquet like in these pictures. My friend used silk flowers so she will be able to keep her bouquet as is forever. If she'd used fresh flowers then the accents would be the memories that last a life time. Or they can be the main attraction of the bouquet. 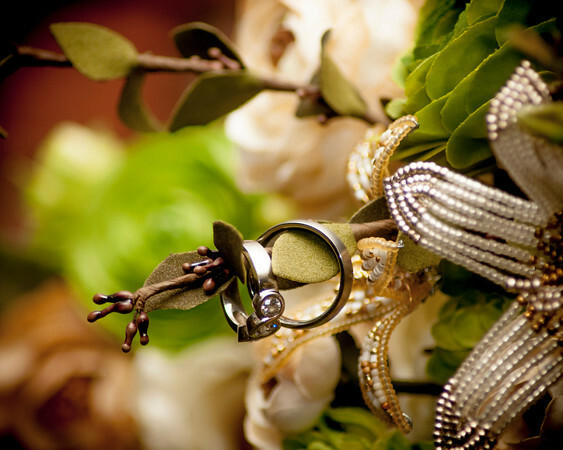 Think of all those lilies in the metallic colors surrounded by baby's breath or other subtle flower. 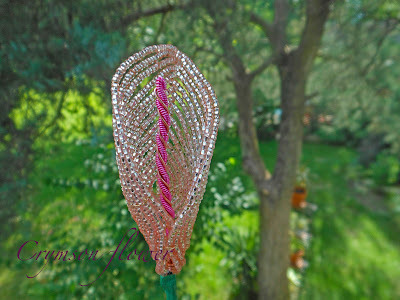 Or maybe even one large elegant bright beaded flower surrounded by accenting fresh or silk flowers. The possibilities are endless. 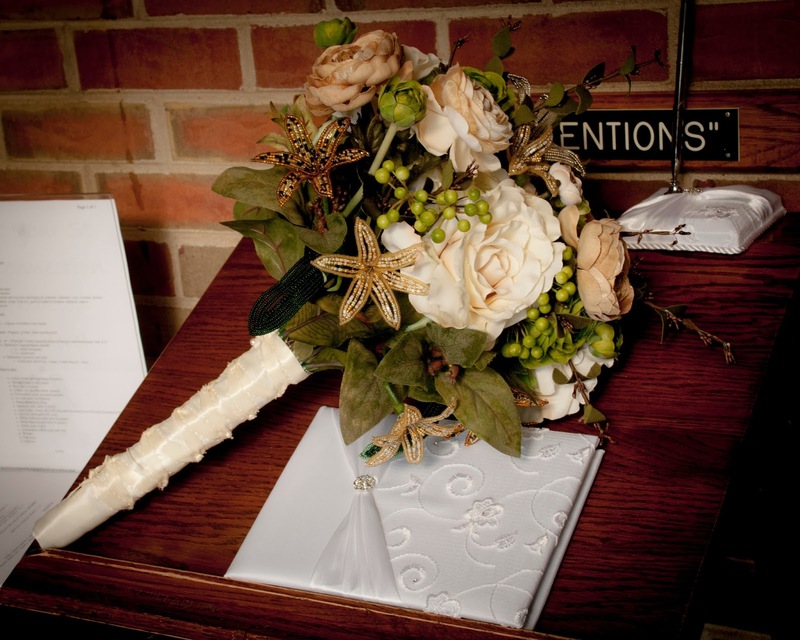 Seeing her bouquet come together and then seeing it on display in her house six months later was really amazing. The day after her wedding was the first day I picked up my beads in 3 years. Interested in discussing how you can have beaded flowers in your wedding bouquet? Email me and we can discuss with no pressure or obligations. 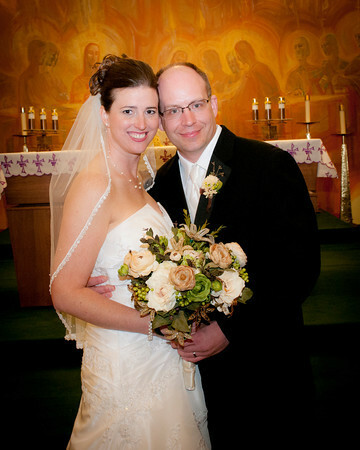 I'm open to brain storming ideas and working with you to make your big day special. This isn't just about creating flowers this is about creating memories and future heirlooms. This week and for the extended future I plan to focus more on the flowers and slightly less on the wine accessories. 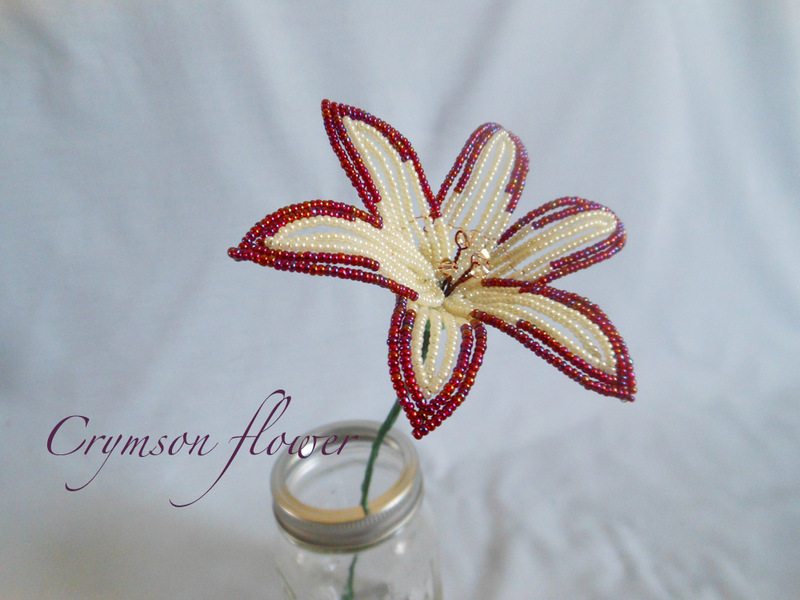 I do enjoy making them and have just recently realized a bunch of them and my early flowers have expired on Crymson Flower. I'll be batch listing anything wine related instead of drawing it out for a week. And those early flowers that went up before Valentines will get some revamped photos and bouquets and anything else I can think of to show them off over the next couple of weeks. All this while I prep for my next two shows. 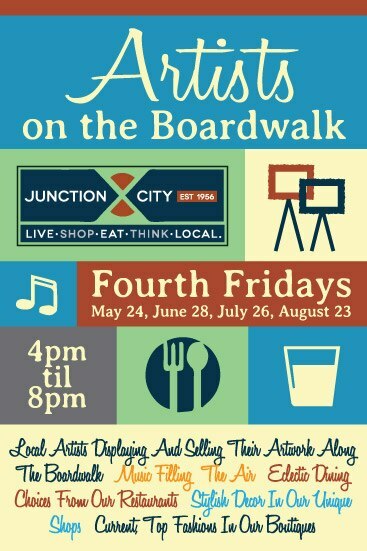 Coming up starting on Friday June 28 is the June edition of Artists on the Boardwalk in Junction City Peoria. I'll spend the evening showing off flowers and talking to the patrons of the local pub. I'm assuming we'll have the same space, so look for me right behind the food, patio, next to the barber shop and pub. Then Saturday and Sunday June 29 and 30 is Rhapsody in Bloom at the Botanic Gardens here in Peoria. This is my big event of the summer. Setting up the canopy, displays, and having enough stock for this two day event. I both nervous and not. Being w/ Mom last week has calmed my setting up nerves. Now I'm focused on more flowers. Specifically for this show more wreaths. I have two new wreaths in the works...mostly done even. This week I hope to complete a third. 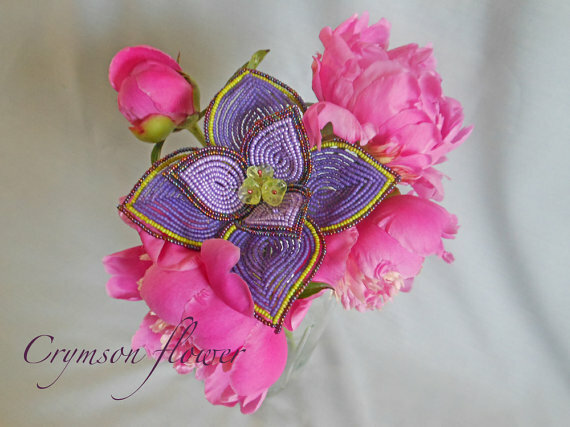 Today's shades of purple and lime rose is not a quiet flower. This flower can and will be seen. It's a very nontraditional rose. 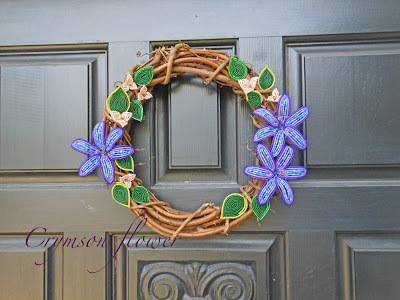 I used three different purples and highlighted them all with a stripe of lime green in the outer petals and center. Later this week, some new pink flowers. 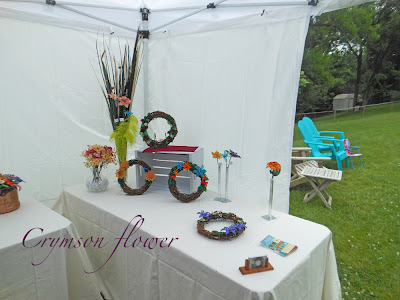 Have you been to Crymson Flower this week? 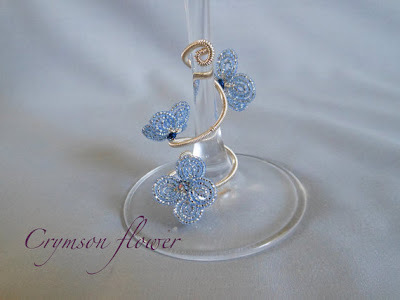 I introduced a new style of wine charm this week, Vine Wine Charms. The brightly colored flowers and wire climb up the wine glass stems. I love these wine charms. They are cute and fun. 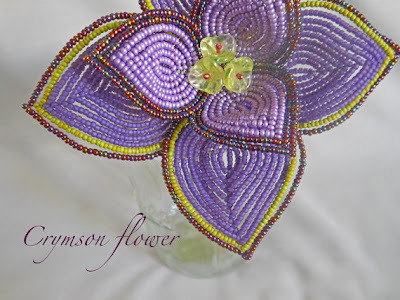 Most of the flowers are made with tiny size 15 seed beads. 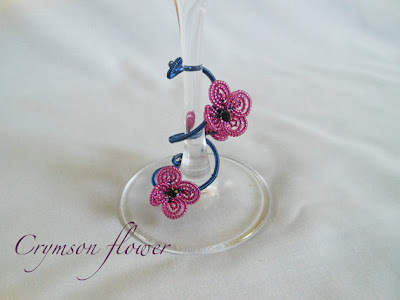 And while I haven't made any yet, I'm planning to makes sets of these wine charms. Last night was date night. We took a break from our creative endeavors and sat on the deck together with a glass of wine and talked. The temps were perfect, warm summer night, the night before the summer heat comes flooding into our world. Everything was green. Neighbors were working in their gardens. Birds and bugs were singing. And we just sat there and watched, like it was our own tv. Cold white wine, that was actually kinda eh, relaxed us. We chit chatted about life, plans, summer, heat, and how we're excited to set up the pool tomorrow after work. I hope summer is visiting everyone soon. I don't think I've ever looked forward to some heat before and I'll probably be sick of it by the end of the week. Right now though I crave the feeling of the sun on me. This weekend was a whirl wind. A dragon birthday party and then a sick 3year old. Milwaukee for the Bead and Button show, and then Saturday was working Mom's first art show in Hinsdale IL. I've talked about Mom's painting before and I'm a big fan of her work. I came to the show to help, but I learned a lot that day and thought I'd share some of that. And hopefully use it toward my big show coming up here June 29th and 30th. First signage is IMPORTANT! I would never have guessed it, assuming people would just know. They should just know that paintings are original. They should just know that they are even paintings and not photographs. That you don't let your kid pick them up and walk away from the booth, even to just show Dad. I learned you can't assume anything. I am thinking of exactly what signs I need and want in my booth. 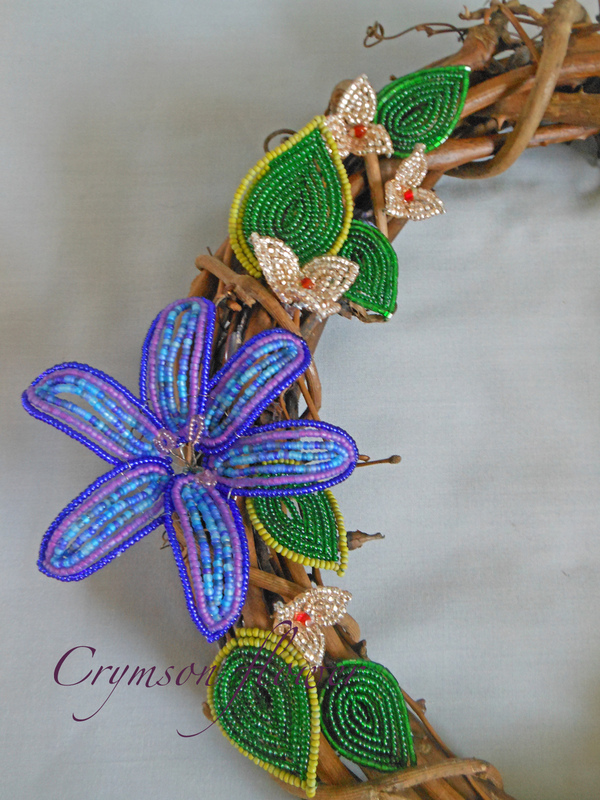 I'm thinking something that says "Original Hand Beaded Flowers, " and something about yes I do take commissions. I'm also hoping to have a slide show on my ipad showing photos of all the commissions I've had so far and how they were used. Like the Mimosa bar, and wedding bouquets, and baby shower flowers. Second lesson, layout and design is important. The display needs to catch your eye. You need color and shapes, especially if your work is small. That something needs to stop a person and encourage them into the booth. I have no idea of how I'm going to translate that from paintings to flowers. But I need to figure it out. Third, it's way easier selling someone else's work. I felt pretty comfortable sitting on or near the booth and discussing the paintings. The colors and themes in them. But they weren't mine...I wasn't selling myself. The biggest lesson was more of a dose of reality. It's scary selling at art shows. You are really putting yourself out there. It made having an Etsy shop look like a breeze. I can hide behind my keyboard and monitor, type big thoughts, spell check them (or not). In person it's putting a part of yourself out there for someone to buy, critique, scowl at, hate, or love. And you have to watch it. You have to learn to see that they are interested and somehow close the deal. I'm now officially petrified by my upcoming experience in a couple weeks. I don't know how to prepare or practice for this. Rethinking the feasibility for bigger Chicago area shows. I like the idea of doing shows. Despite my fear, part of me wants to really give this a try. But I finally recognized a huge obstacle I have and need to conquer before I move to Chicago area art shows. Booth fees alone for Chicago area shows are a few hundred dollars. I need to be able to make at least that back to attempt to break even. That means I need to sell A LOT of flowers/wine charms, or make some bigger ticket items. I think my flowers will already be bordering that art vs craft debate and lower prices will encourage that. I have no idea if this obstacle is even possible to overcome. Hinsdale show was nice. They had a pleasant variety of arts, and the people were all very nice. I'm sure I could jury into the show. But if I had done it this weekend I doubt I would have come close to making back the booth fee. This will be an internal debate for a while. I'm hoping to find a good solution. Back from Bead and Button and it was something else. I knew it would be overwhelming but I'd forgotten how crazy it can get in there. I was expecting more people...I remembered more people. But I was glad that it wasn't horribly packed. The big shops I like to hit were still there as usual and it was great to restock on my favorite colors. Some of the smaller shops that we'd hit in the past were still there too. But some of the unique shops that had tons of hanks of seed beads weren't there. I wonder if they are even in business anymore. I did find a couple new gems. And I didn't have any trouble finding stuff to buy. And I didn't have any trouble finding ideas of all the possiblities that I could take my flowers. Ideas like stamping sheet metal to make a little tag or to personalize flowers. Or using some amazing gemstones to take a flower to the next level. Or maybe to keep expanding the bracelets I've been playing with. I had to try and keep focused. I mostly stocked up on seed beads I needed or those that inspired me. I don't think I came home with as many different beads as I once did. I think a portion of that is that my stock has gotten so big that I've seen a lot of what is out there. Newer stuff is a lot harder to find. We packed up the car and tomorrow we leave at the crack of dawn to Mom's first art show of the season. Should be fun to scope out the Hinsdal Art Festival. If you're in the area you should definitely stop by. I feel inspired. Maybe it's the week off I took from almost everything. Maybe it's all the rain washing away the long cold spring and inviting lush green life into the world. Or maybe it's just one of the freak times when I don't have enough hands or hours to try out ideas that I have bursting out of me. It's been painful not to work all the time on some of my new projects. One of those projects has been bracelets. I came out of my last show with lots of knowledge and not sure what to do with it all. How much to change based on one show. And honestly even if I wanted to change or add something new to my inventory...there's not a lot of time until my next show to make sure I have a sturdy enough inventory. That didn't stop me from experimenting though. For years I've been trying to come up with an exciting idea for a bracelet. 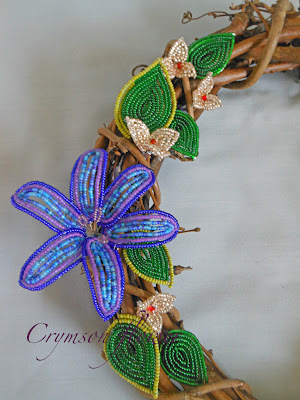 Something that uses the techniques of french beaded flowers and wire work. Until recently I've drawn a blank. Last week I finally let myself experiment. I decided to start simple and instead of a full flower go with two petals. I learned so much from this bracelet. First I made it about an inch too long, but that's easily fixed. I learned how I can attach my petals to a base wire. I learned what gauges work well in different areas. This is a very versatile design that can be repeated in any combination of colors. I loved adding the touch of colored wire to the band. 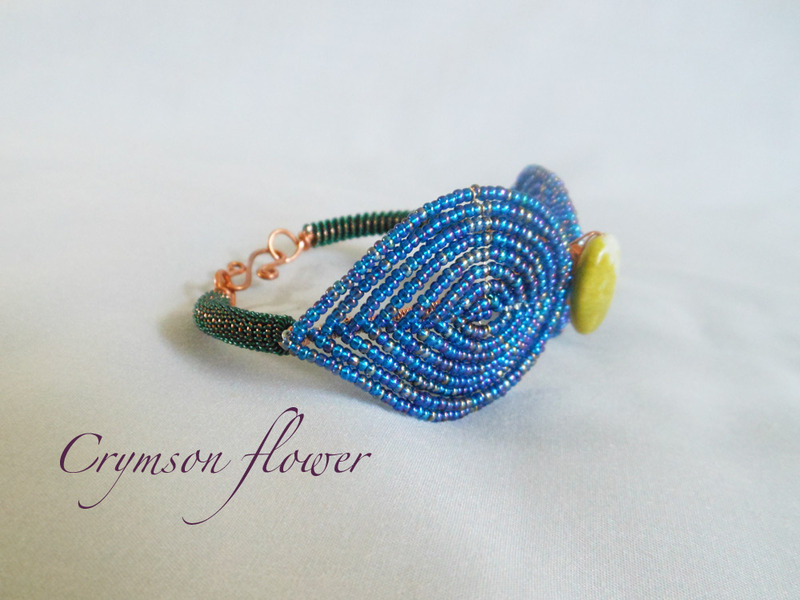 Immediately after finishing this bracelet I had ideas for a couple more in completely different designs. I want to redo this on in different colors so that it will fit...but that's on the back burner for now. 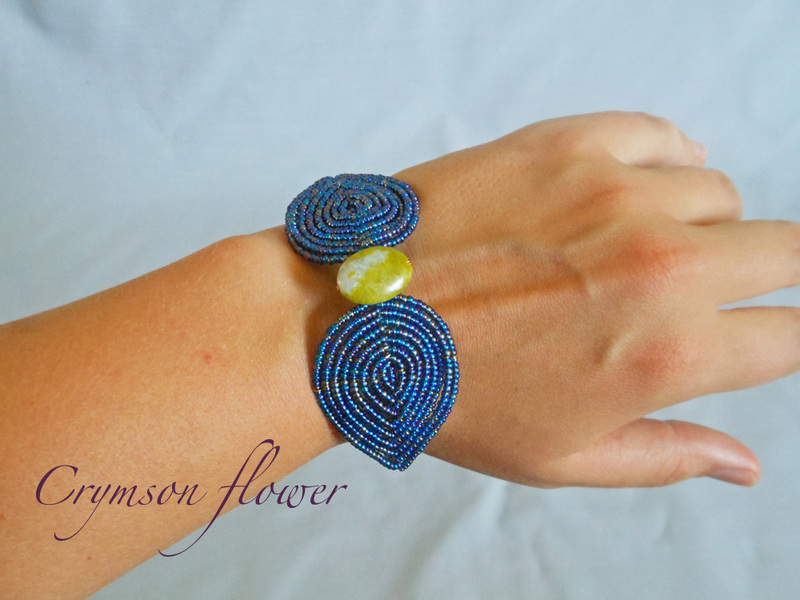 This weekend I finished the second bracelet. I didn't get a chance to take any pictures yet. But it's more of splay of petals and a side clasp. 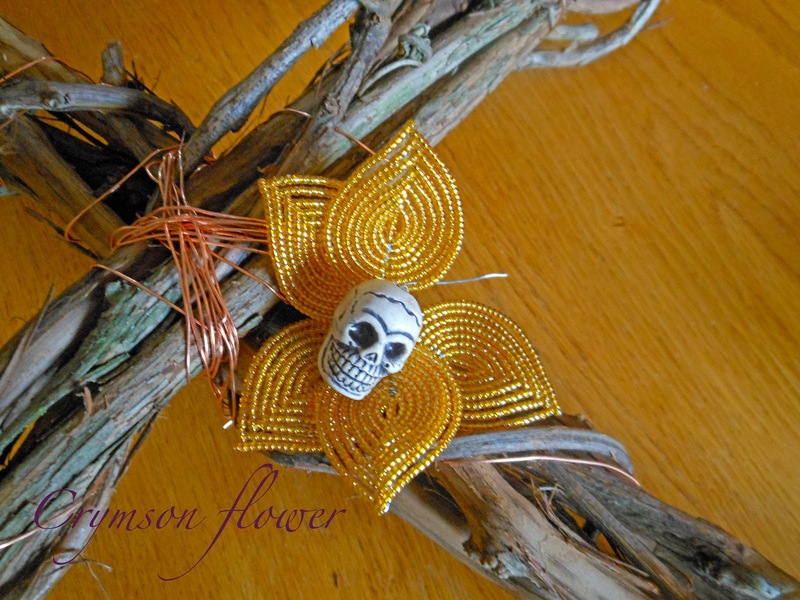 I'm also completely inspired to make flowers. I have plans set for another few flowers plus quite a few more wreaths. About a month ago I discovered that my local art guild has a call for entry's for an upcoming exhibit, Dia De Los Muertos, or Day of the Dead. This got some gears turning. I first started thinking about a Day of the Dead wreath...but I thought a cross would be more fitting. 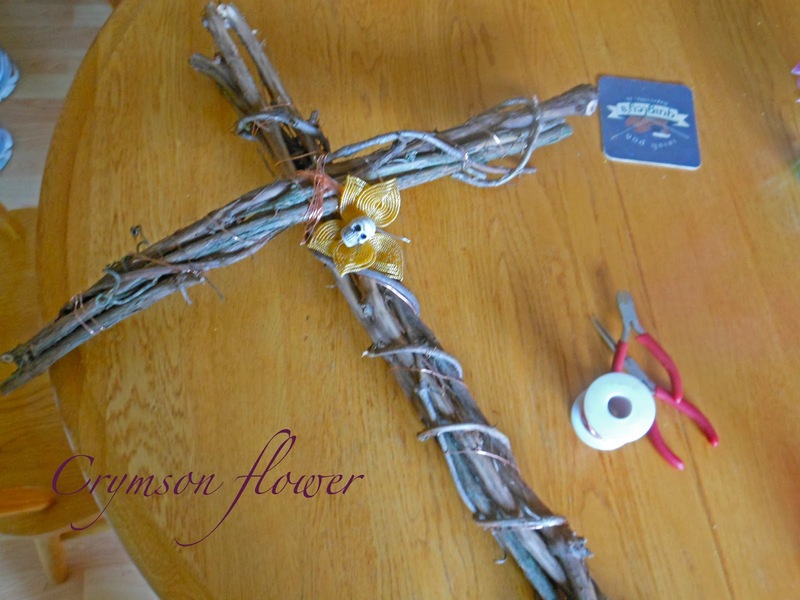 But I wanted the cross made out of grape vine. I want it to look gnarly and rustic and handmade. This morning is the first day in ages that it hasn't rained so R and I went down into the field hunting down grape vine. I came up with this cross and I'm really happy with it. It's creepy and perfect. 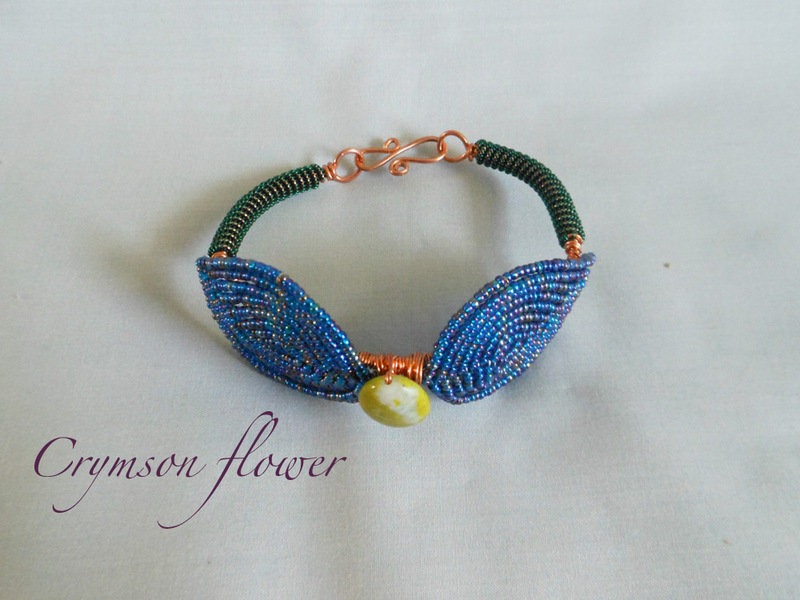 I wrapped it together using smaller grape vine and then stabilized it with copper wire. A week ago I found some amazing skull beads and bought them. Last night I made the first flower. I'm so excited about the potential with this project. Not sure if I'll enter it into the art guilds exhibit or not. That depends on how quickly I finish it and how it looks in the end. Either way I'm super pumped and inspired by this piece.